The Maj. General Gajinder Singh, GOC 2 Mtn Division on Saturday inaugurated the Memorial of Martyr Hav. Hangpan Dada, Ashok Chakra (Posthumous) with a great military honours amidst huge gathering. Addressing the gathering, Maj. Gen. Gajinder Singh, said that in recent Army recruitment conducted at Jairampur, Changlang District, more than 4000 youths from Arunachal Pradesh participated in the recruitment rally. More Army recruitment is being carried out in the days to come, he added. It may be recalled that Havildar JD Hangpang Dada attained martyrdom on 26 May 2016 in the Naugam Sector of Jammu and Kashmir, while foiling a bid by heavily armed terrorists trying to infiltrate into Indian Territory. The team of soldiers under the leadership of Havildar Hangpang Dada successfully foiled the evil designs of the infiltrators and eliminated four heavily armed terrorist, but in the ensuing fire fight the Brave heart sustained fatal gun shot wounds and made the supreme sacrifice in the line of duty. 36 years old, Havildar Hangpang Dada was enrolled in the Assam Regiment in year 1997. He was honoured posthumously, with the government announcing the highest gallantry award during peace-time operations, the Ashok Chakra, on the eve of the Republic Day in 2017. Earlier the programme started with prayers and garlanding of flowers to the Portrait of Martyr Hav. 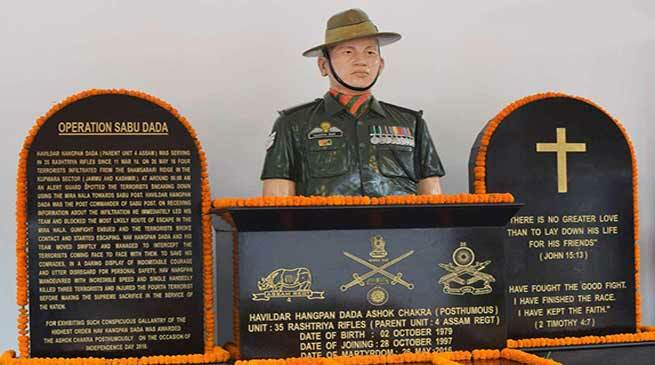 Hangpan Dada, Ashok Chakra (P) to marked tributes to the Martyred Dada led by Chief Guest Maj. Gen Gajinder Singh which was followed by Smti Chasen Dada (Wife), Miss Roankhin Dada (Daughter) and Senwang Dada (Son) of Martyr Dada and other dignitaries.